When you think of Peruvian food, or Mexican food, you probably do not think of soup. Yet soup is a mainstay of both. On Sundays, here in the United States, if I go to a place where Mexican workers congregate, I will see them with big bowls of soup before them—posole, menudo, and much more. It is the same in the Andes. 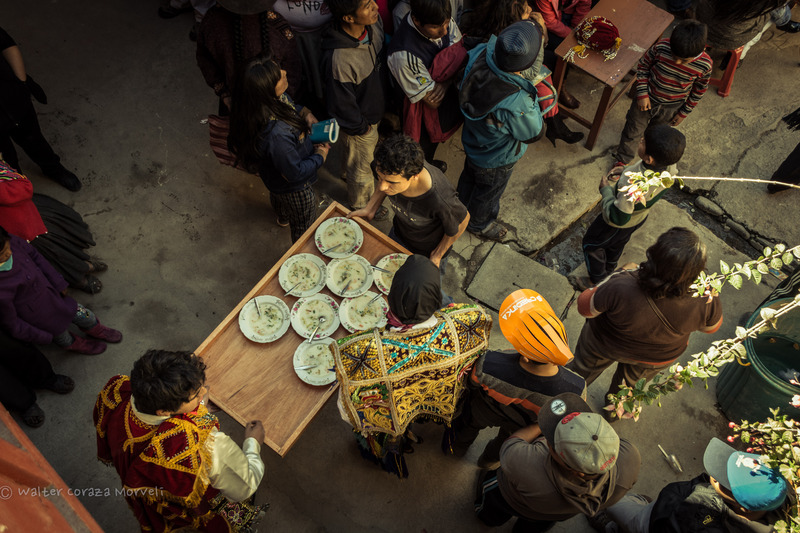 People gather around stands offering soups first thing in the morning, at lunch and in the evenings. 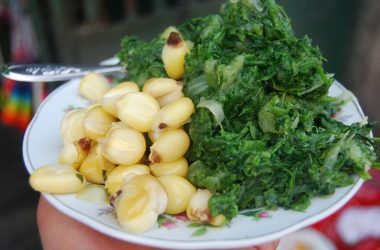 In Peru or Bolivia, a complete meal always begins with a soup which is followed by the main courses or appetizers people are more likely to think of when trying to symbolize their national cuisine. 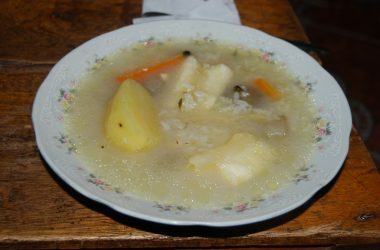 In rural areas in the mountain communities that form both county’s backbone, mornings begin with soup and the day ends with soup, although in the middle of the day people may pause their labors to eat what they call fiambres or phutis in the Aymara-speaking areas, boiled potatoes, ocas, fava beans, and more arranged around a bowl of hot sauce. Sometimes there are bits of meat, but soup is where people generally find meat and where they consume vegetable and animal based broths that fill them and provide their bodies with the liquid they need to keep their bodies functioning. Not only are they the beginning, the first course of a paradigmatic meal, soups are at the base of what it means to have food and eat. Nevertheless, those who would make food into national symbols prefer something drier and of more substance. In Peru they like ceviche and before that lomo saltado. Even the tacos that symbolize Mexico to many seem more substantial than soup. These dishes of national being are not liquid. They do not slosh around in a bowl. But water, whether in the form of the great god Tlaloc of the Mexica, the god of rains, or the Andean division of the seasons into wet and dry, signifies life and fertility. 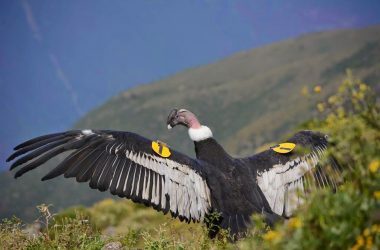 The Andean’s great God, Viracocha’s name refers to a lake, as if a bowl of fatty soup. Death is dry. Life is wet. Soup, as a result, may well be a better and more authentic symbol of national belonging than the pollo a la brasa (rotisserie chicken), the arroz chaufa (fried rice), or baked guinea pig in Peru. It is what people want. They love lifting the rich broth redolent of meat and vegetables to their mouths and letting themselves be bathed in its humid breath. In Cusco, soup starts the day for many. Though the picanterías have recently been declared National Cultural Heritage, the calderías (or soup stands and restaurants) should also be so named. With their big pots of simmering broth and benches and tables filled with clients, silently spooning away, they are a key to Peruvian life. People tend to seek out soup to start the day, while they go to the picantería in the late afternoon, to end the day with friends through talk, play chicha, and food. The soup places are quieter and more reverent, yet still essential, balancing the day as they do. Boiling is also one of the classic forms of cooking manifested in the myths of Inca origins. When founders of the Incas, the Ayar sisters and their brothers, came out from the mountain, they brought with them pots in which they could boil. That is right at the heart of life. Soups disappear from consciousness though in the Andean pairing that gives weight to the segunda, the main dish that like the melody with words and dance steps, coming after a strummed introduction, seems the most significant. A tourist eating Chicken Soup in San Pedro Market, Cusco. The main dishes also seem to cross ethnic boundaries, while soups either remain the points of beginning the meal, or remain more common among the more indigenous for breakfast and even supper. The fried and grilled meats remain the macho stars, while the soups, coming from a pot, suggest the indigenous background, the womb of beginning. 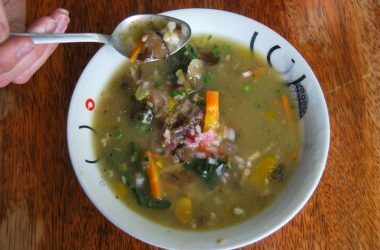 The simple broths, with or without meats, though almost always with potatoes cross from one side of the mountains to the other in Peru. They are the fluid and liquid reality that makes the grilled, baked, or fried meats possible. Indeed the most basic soup is simply a boil of water and potatoes that you often get in rural communities if you eat in people’s homes. This tends to be the morning and evening meal. 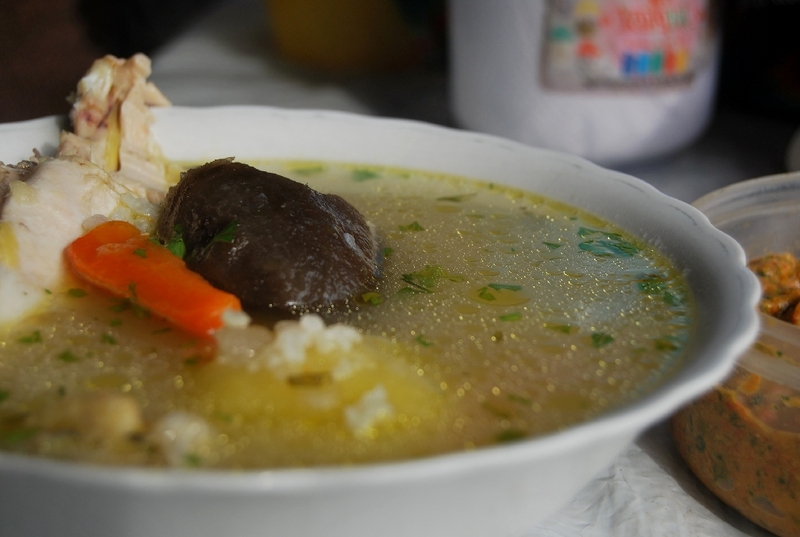 In the cities, though, the caldo de gallina may well be the most common and the most desired of soups. Big vats of it are present wherever people gather in the mornings. Strangely, Rosario Olivas Weston did not include a recipe for either this soup, or the basic potato soup, in her magisterial description of the cuisine of the once-Inca city and state, Cusco: el imperio de la cocina. They seem to have passed beneath her gaze. Nevertheless, the adventurer Copeland Marks describes it in his orientalist cookbook, The Exotic Kitchens of Peru. 4 lbs hen parts, or chicken parts although free-range hen has more flavor than standard chicken. 1 piece of fresh peeled ginger(about one inch in length), crushed. 1 1/2 lbs. whole pasta shells or some other shape of your preference. Bring the water to a boil and add the hen pieces, and boil for 1/2 hour skimming the foam occasionally. Check to make sure the meat is tender. Add the rest of the ingredients except the pasta and boil for some fifteen minutes more. Ad the pasta and cook for an additional ten to fifteen minutes, depending on how al dente or how soft you want the pasta. Serve a good sized piece of chicken in each bowl along with the broth. Sprinkle with minced scallions. You should also accompany this with an uchukuta for people to add to their soup, according to taste. The uchukuta is a ground hot sauce.